In the seventh century a monk from Crediton, Devonshire, went to Germany to teach the word of God. His name was St. Boniface. He did many good works there and spent much time in Thuringia, a region later to become the centre of the Christmas decoration industry. 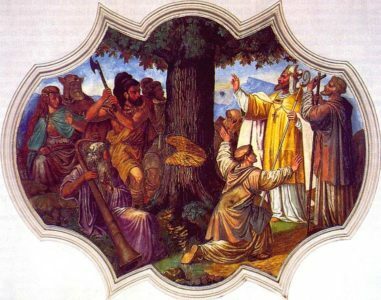 Tradition has it that St. Boniface used the triangular shape of the fir tree to describe the Holy Trinity of God the Father, Son and Holy Spirit. The converted people began to revere the fir tree as God’s tree, as they had previously revered the oak. By the twelfth century it was being hung, upside-down, from ceilings at Christmas time in Central Europe, as a symbol of Christianity and was referred to as the ‘Tree of Christ’. The first decorated tree was at Riga in Latvia in 1510, while the first Christmas tree came to England with the Georgian Kings from Germany. 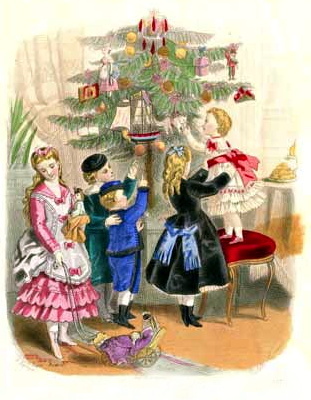 At this time, also, German merchants living in England decorated their homes with a Christmas tree. 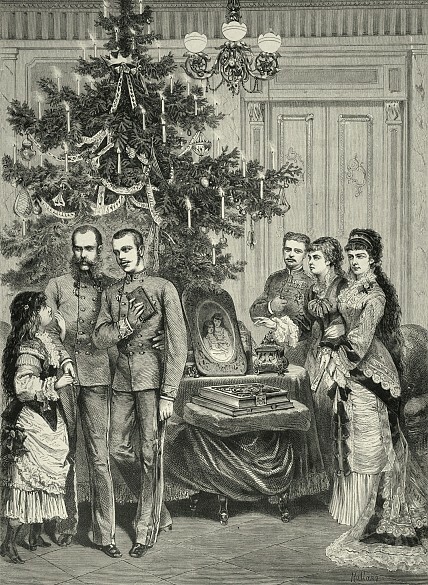 The British public were not fond of the German Monarchy, so did not copy the fashions in vogue at Court, which is why the Christmas tree did not become established in Britain at that time. In 1846, the popular Royals, Queen Victoria and her German Prince, Albert, were featured in the Illustrated London News. They were standing with their children around a Christmas tree. Unlike the previous Royal family, Victoria was very popular with her subjects, and what was done at Court immediately became fashionable. The English Christmas tree had arrived! The Christmas tree, with its beautiful decorations, lights, and star or angel on top, helps to elevate the soul above the materialistic aspects of modern day Christmas. The tip of the tree points to a marvellous world that is Heaven. To show how the introduction of the custom of the Christmas tree was a gradual process and how it favours the elevation of the ambience, we will tell the story of a Catholic family in Austria as written by P. Rosegger in his book Peasant Life in Styria. ‘It had long been a great desire of mine to put into practice something I had heard was done in other towns to celebrate Christmas. One should put a small fir tree on the table, affix candles to its branches and place presents for the children underneath, explaining that it had been the Child Jesus who had left them there. ‘So I had the idea to setup a “Tree of Christ” for my little brother, Nickerl. But I needed to do this secretly (part of the procedure) and before my mother entered the kitchen to prepare breakfast. ‘As soon as there was enough light, I went out into the cold. I hid my gaze from those working around the house and when I returned from the forest with a small fir top, I ran to the barn where the horse carts were kept to hide it there. ‘It was soon night. The servants were still busy with the stables and in the bedrooms, where, according to the custom of Christmas Eve, they washed their heads and put on festive clothes. My mother was in the kitchen preparing her typical Christmas sweets. And my Father was with little Nickerl going around the property blessing it with incense, praying all the while. It was necessary to expel the evil spirits and attract angelic blessings to the house. ‘Thus while everyone was busy with their tasks, I prepared the “Tree of Christ” in the main room. I took my tree from its hiding place and put it on the table. I then cut ten or twelve candles from the wax block and placed them on the branches. Underneath I put some sweetbread. ‘I heard some slow and gentle steps on the floor above. I knew it was my father and my little brother who were there blessing the loft. They would soon be coming to the main room. I lit the little candles and hid behind the stove. The door opened and they entered with the incensor and then stopped…. ‘The little Nickerl looked on dumbfounded. 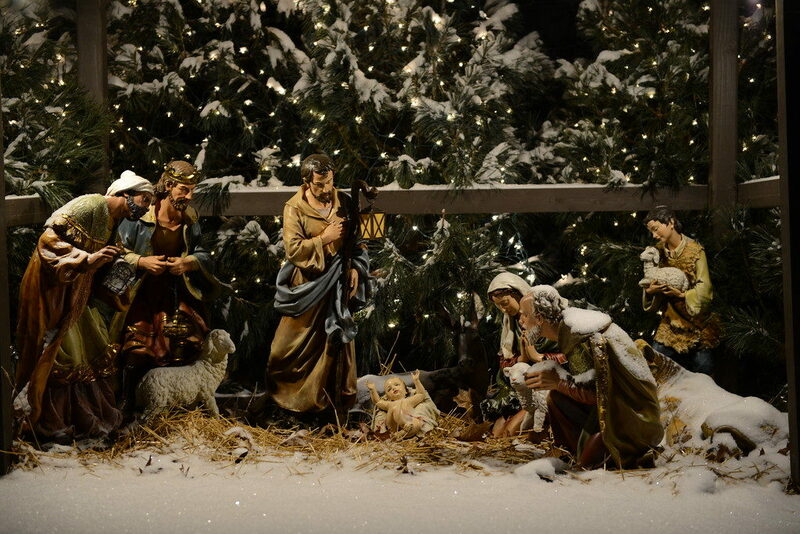 In his big, round eyes were reflected the lights of the “Tree of Christ” like little stars. ‘They all contemplated and marvelled at the tree. And the smoke of the incense filled the whole room and formed a delicate veil that rested on the illuminated tree. As we mentioned earlier, the top of a Christmas tree points towards a marvellous world, the world of Heaven. In this light, let us consider an enchanting tale about a Christmas tree. The story elevates one’s spirit to a higher plane, thus satisfying our desire for that which is marvelous. Pious legend recounts that when the shepherds went to adore the Divine Infant, they decided to take Him fruits and flowers from the area. 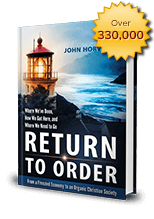 After this harvest, the plants congratulated themselves on being able to offer something to their newly-born Creator: one had given its dates; another its nuts, and so on. From the fir tree, however, the shepherds had taken nothing because its needle-like leaves and sharp cones were not presentable gifts. God was pleased with the humility of the fir tree, and, as a reward, ordered a multitude of little stars to come down from heaven to adorn it. The stars were of many colours: gold, silver, red, blue, etc. When a group of shepherds passed by, they not only took the fruits of the other plants, but they also took the whole fir tree, as such a marvel had never before been seen. Thus the fir tree ended up by decorating the grotto of Bethlehem, being placed very close to the Child Jesus, Our Lady, and St. Joseph! This entry was posted in Featured and tagged Christmas, Christmas Tree, nobility, organic Christian society, Plinio by RTO.org. Bookmark the permalink.